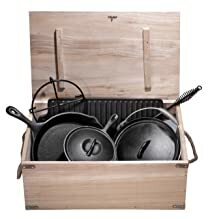 Round out your camp cookware collection with the Bruntmor 7 piece Gourmet Cast-Iron Cookware Set in a vintage style wooden box. 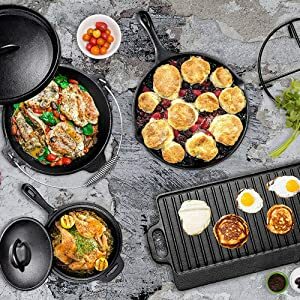 The set includes a griddle, skillet, lid lifter, grill pan, 5-qt. 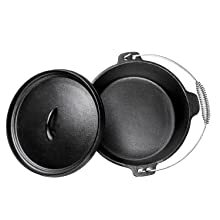 Dutch oven with lid, saucepan, and Dutch oven rack so you have the right cookware to prepare delicious food at camp. 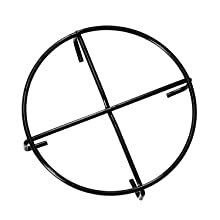 The set features durable cast-iron construction. A great gift idea for weddings, business gifts, friends and family that love camping, and more. Makes for an incredible outdoor cooking experience. Bring some old charm into someone's life today! Cookware can also be used indoors. 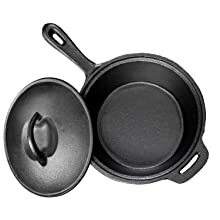 Pre-Seasoned 12" Cast Iron Skillet, 4.5qt Dutch Oven Pot, 2.5qt Saucepot, 20" x 9" Heavy-duty Reversible Cast Iron Griddle.
" This set was perfect for our camping trip - we ended up using every piece in our open flame culinary adventure! The box is nice and makes it easy to pack up and throw in the car, with a little extra room in there for other things you might need. The set is pretty heavy and the rope handles make it easy for two people to carry it if necessary. "